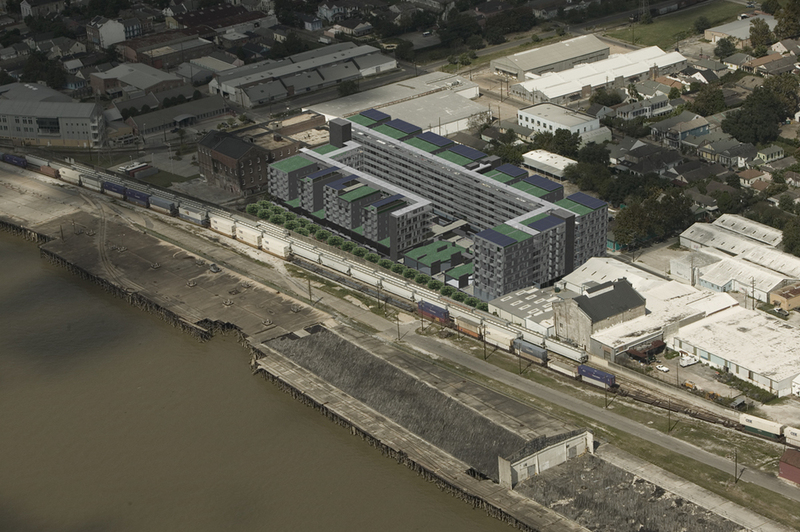 The competition, sponsored by McGraw-Hill Construction's Architectural Record and Tulane School of Architecture, called for a 160-unit housing community with mixed-use components on a high-ground site by the Mississippi River. In Southern Louisiana, there exists a unique hybrid ground for architectural investigations. This ground consists of geological, cultural, ecological, and tectonic conditions that interweave and overlap to create a non-repetitive, patterned identity of multiple and hierarchically understood variables. It is easy to pick up and move when the culture you know is all McDonalds. But if you grow up the way I did, in Louisiana, you don't in your travels, find anything like it. Glen Petre, Harvard educated filmmaker who moved back home to Southern Louisiana. We call this hybrid ground the “Terra Viscus: a super-saturated ground, one that is never completely solid or liquid, one that is never in stasis but in a continuous state of being made and being removed.” The Terra Viscus condition allows us to vivify, to analyze, and to create relevant building strategies in the physical, cultural, and phenomenal identity that is Southern Louisiana. Our solution to settlement in The Terra Viscus is a hybrid tectonic. We re-conceive the traditional strategies at every scale to allow for a contemporary occupation. High Density on High Ground is a hybrid. It demands an expansion of the traditional New Orleans vertical occupational layering (a compact vertical stack of land and/or water_air_occupation_skin_sky.) hybridizing the traditional vertical occupation as an urban strategy. When both occupation and urban are expanded vertically, multiple physical, cultural, and phenomenal events can simultaneously occupy the limited high ground. The residential occupation begins on higher “Higher Ground.” As part of our solution we created a new “Higher Ground” 28 feet above the original site. The two levels contained below this new ground hold all the parking, lower courtyards, and retail components. It is an area designated for flood if need be, made of structure and materials that except water. 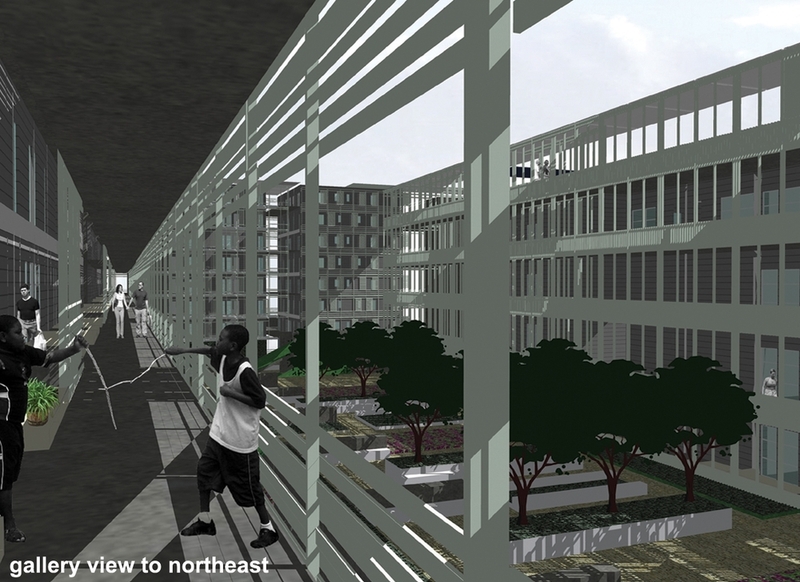 Upon the new “Higher Ground” the project consists of 4 major components: courtyards, levees, battures, and the housing towers. There are 14 towers ranging from 4 floors to 8 floors. They are all connected by a series of gallery walks yet they remain structurally independent to allow for maximum airflow, views, and exposure to natural light. The residential towers are skinny, reminiscent of the shotgun form found throughout the city, as are the typical units. The street facades are clad with a shuttered skin that subtly changes depending on its relationship to the sun; the interior facades the gallery walks shutter. 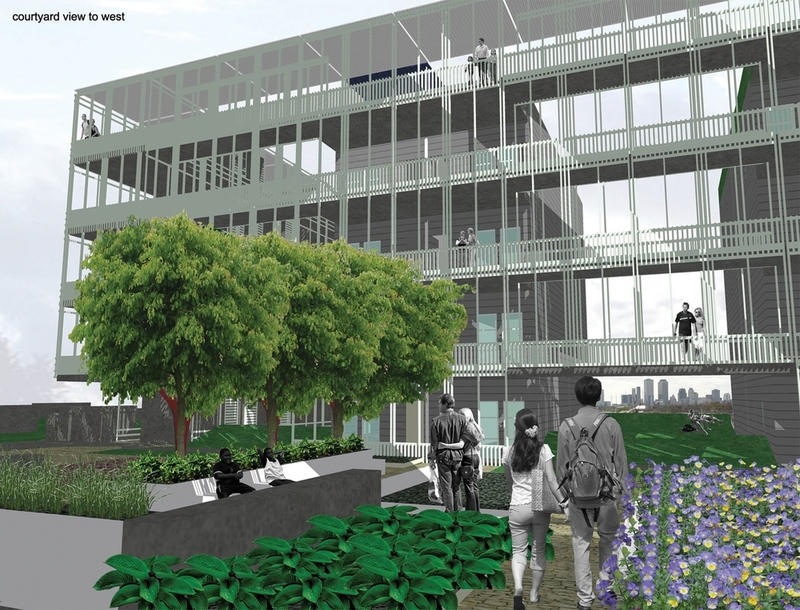 The new “Higher Ground” is made with courtyards, levees, and battures. The new topography these components create, provide the residents with areas to congregate, garden, play, and be outdoors. It also provides views to the city and to the river giving this new residency block place in the city. Why do this? Because our Louisiana Culture is tied to this land and always has been.